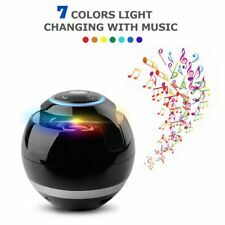 Wireless Bluetooth Speaker Subwoofer Mini Round Portable Magic Ball For All Smart Phone & Tablet color change. Model:Wireless Bluetooth Speaker BV-B22. 1x Bluetooth speaker. Equipped with the advanced Bluetooth 3.0 EDR technology, compatible with most Bluetooth-enabled devices.Tiny shape with a incredible sound.Multifunction with Bluetooth/ TF card/ FM support/ Phone call. NEW 350W MOTORCYCLE BOAT ATV SCOOTER CAR AMPLIFIER USB MP3 SD FM RADIO SPEAKERS. Max Power : 350w Peak. Amplifier Frequency Response: 20Hz - 20KHz. SD/TF Card Reader Supports up to 4GB SD card for MP3 Playback. Feature: 1. 100% brand new and high quality. 2. Fashion wood grain pattern mini speaker full of personality and make your speaker more attractive, compact size and delicate appearance suitable for you to listen to music in the car at home/office/bedroom or even walking outside. 3. With Bluetooth hand-free function, can liberate your hands so that it can guarantee the security when driving. 4. Suitable for most kinds of mobile phones tablet PC with Bluetooth functions. 5. Amazing voice, you can enjoy rock, electronic and metal freely! . RMS Power: 500W. - 2 channels mini amplifier. 1 x Audio Amplifier. - Compact and efficient, perfect for handling your audio demands in style. - Matched with power cable and audio output cable. Frequency Response: 20Hz ~ 20 KHz. This set of mini speakers is specially designed for Desktop, Laptop, Notebook, Tablet PC. Wide Compatibility: Perfect for desktop, laptop, DVD, TV, smartphone, tablet, and other devices with 3.5mm audio port. Hi-Fi Tube Amplifier. Digital Amplifier. Integrated Amplifier. Headphone Amplifier. AV Tube Integrated Amplifier. Output power: 2×50W 100W Subwoofer. ★✔This product is a 2.1-channel digital power amplifier, Cost-Effective and high performance, Mini and compact, High-Power with HiFi good sound and very useful,almost match any speaker on the market, the most perfect 2.1 digital amplifier, you deserve to have.